Back in November 2015, Hasbro Studios decided to take the same writer's room model that generated several ideas for the Transformers franchise, to create a new writers room that will formulate ideas for the G.I. Joe and Micronauts franchises. Akiva Goldsman, who lead the Transformers writers room, will supervise these new writers rooms, and while it isn't clear yet who is coming aboard to help shape these new franchises, Hasbro Studios head Stephen Davis and Simon Waters, who oversees consumer products for Hasbro Studios, shed some light on their approach in a new interview. It seems the studio is targeting the millennial generation, teasing a lot of changes for the franchise. The Los Angeles Times caught up with Stephen Davis and Simon Waters, who made it clear that they want to create a movie universe on par with Marvel Studios using all of these franchises. Back in January, director D.J. Caruso teased that when he was attached to direct G.I. Joe 3, he wanted to have the sequel crossover with the Transformers. The director revealed that, at the end of the script he was developing for G.I. Joe 3, both the G.I. Joe and Transformers worlds collided, but Hasbro told him at the time that they weren't ready for that yet. When asked about their plans for the G.I. Joe franchise, Simon Waters didn't mention a Transformers crossover, but he did hint that the franchise would undergo a "millennial" overhaul, of sorts. "(We want to take) a more millennial approach. The world has changed, and I think you're going to see G.I. Joe changing with it. There's going to be a much more contemporary approach to the whole franchise, and that will allow us to develop different characters." Simon Waters wouldn't elaborate on what this "millennial approach" may be, but it's clear that Hasbro wants to reach a younger audience, while still keeping the established fan base intact. This project is reportedly in the "writing phase," but Hasbro wouldn't offer any specifics, nor reveal who is writing this G.I. Joe reboot. A few months before Hasbro announced their G.I. Joe writers room, Aaron Berg, who wrote the Black List script Section 6, was hired to write the script for G.I. Joe 3, but it isn't clear if is script is being revamped, or if he is part of this writers room. Here's what Stephen Davis had to say about what they want to accomplish with this G.I. Joe reboot. "We hope to create a head snap. It's a different kind of Joe, one that still resonates with Joe fans but brings in an uninitiated audience and expands the audience internationally and domestically." The big screen franchise started in 2009 with the action-thriller G.I. Joe: Rise of Cobra, which earned $150.2 million domestically and $302.4 million worldwide, from a massive $175 million budget. The 2013 follow-up G.I. 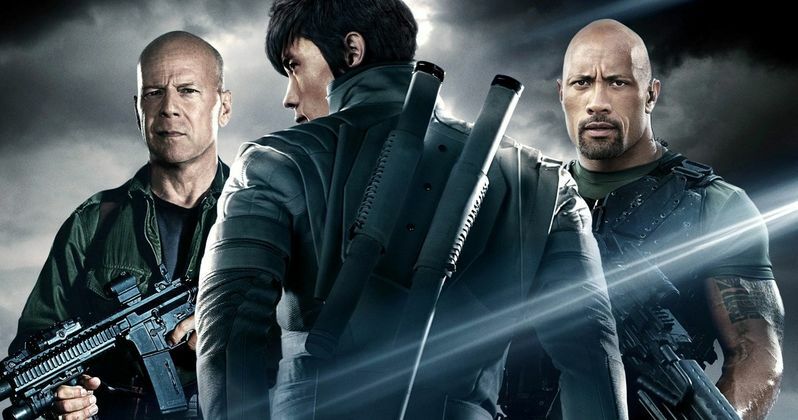 Joe Retaliation, which brought Dwayne Johnson and Bruce Willis into the fold, fared worse domestically ($122.5 million), but better internationally for a worldwide total of $375.7 million, from a pared-down $130 million budget. It isn't clear if Dwayne Johnson or the rest of the cast from G.I. Joe Retaliation will return for G.I. Joe 3, but it seems clear this will be a much different movie than fans have seen in the past.